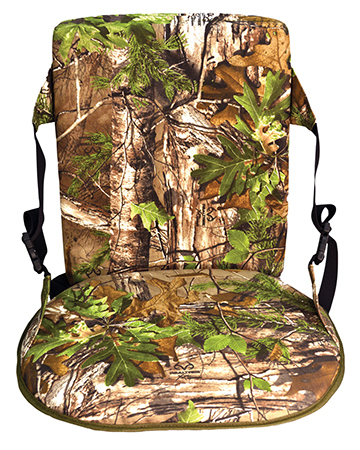 The Flat Back Foam Seat offers hunters plenty of padding to help them stay comfortable for extended periods of time while sitting on a stand or at the base of a tree in the turkey woods. It's constructed using 600D water-resistant material. The two-inch thick seat is light weight and flexible, with three layers of open and closed cell foam for comfort and durability. The Flat Back Seat includes an attached back with one-inch thick foam for extra support. It has a carrying strap and adjustable side straps that can also double as a tree strap in deer stands to hold the seat in place. The Flat Back is not only great for deer and turkey hunting, but for waterfowl hunting, fishing, ice fishing and any other sports activity where durable, comfortable seating is needed. It is finished in Realtree Xtra camo.